Do something just for you this spring! 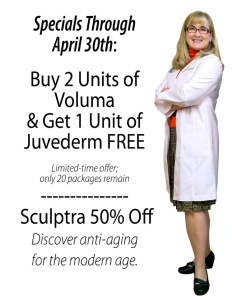 We have some fantastic specials on Sculptra, Voluma and Juvederm. These injectables don’t require much down time and one of my patients calls them her ‘virtual facelift’ which is a great description. Call today, supplies are limited. Savannah location = (912) 920-2090 or Statesboro at (912) 681-7793. Don’t wait, you deserve it!